I often wonder whether or not H.R. Giger ever thought that his alien concept and design would ever become so popular. Since creating the creatures for the critically acclaimed film; Alien, back in 1979, Giger’s monsters have been endlessly emulated, reiterated, and used for action figure lines, statues, novels, video-games and films as well as having his creation pitted against other interstellar beings. Not forgetting comic-books, Dark Horse has released a brand-new mini series in 2009 focusing on new heroes and indeed a new strain of alien. John Arcudi has crafted an enjoyable Aliens tale involving a research team who land on a planet in the Chione system, only to be greeted by fellow humans who don’t exactly give them the expected welcoming. After the locals gun down the research crew, a single survivor, David Sereda, manages to dig himself out of his grave (think Bishop) and return to the ship in order to make his escape. As Sereda readies for takeoff, he hears a distress call on his comm and learns that a girl named Andrea Keats is lost in a canyon somewhere on the planet. Together with newfound companions, Sereda must ascertain as to why the locals are literally out of their minds as well as find Andrea. Mix in a species of alien that doesn’t lurk in the shadows or use sneak attacks, rather opting for direct, never-back-down tactics and you get an interesting take on the Aliens universe. As pictured in the last panel, the aliens are red in colour as well as having extended mandibles. I quite enjoyed this new entry from Dark Horse, while I didn’t think that the artwork was of the highest calibre (excluding the last two covers by Raymond Swanland, which are brilliant), the storyline more than makes up for it, I’m also looking forward to reading the new Predator mini series but will only read it once I have the final issue (I hate having to wait). Give Aliens a read if you’re a fan of the extended universe, it won’t disappoint. 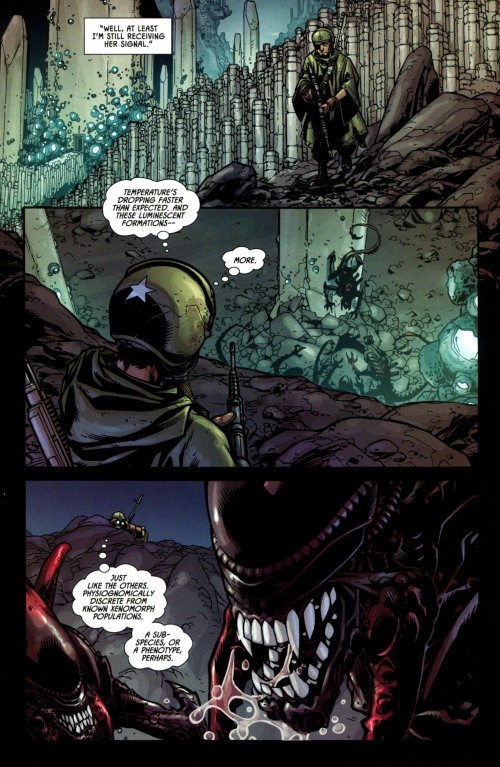 This entry was posted in Comics and tagged aliens, comic-books, dark horse, john arcudi, xenomorph. Bookmark the permalink.